Love is in the air, and we’ve fallen hard for some of our favorite desserts. Double the desserts=double the fun! Whether you’re looking for an easy Valentine’s Day dessert to make next week or you’re looking for an everyday cookie recipe that’ll keep you reaching for more, it’s double the trouble with our latest eCookbook collections. We start off with some of our most heavenly chocolate recipes including layered dessert trifles, homemade chocolate cake, rice chocolate pie, and much more in our aptly-titled, Death by Chocolate: Dessert Heaven with 30 of Our Best Chocolate Recipes. If you’re looking to step back from the chocolate overload, then we’ve got some munchies that’ll taste just as yummy as they smell with our eCookbook entitled, Cookie Jar Favorites: 35 of Our Best Cookie Recipes. Want a sneak peek of what’s to come? Then keep reading (and try not to drool all over your keyboard)! With February 14th just around the corner, we bet you’re already starting to consider just what Valentine’s Day dessert recipes you need to “wow” your sweetie. We don’t know about you, but Valentine’s Day and chocolate go together like peanut butter and jelly. They’re simply inseparable! And what better way to show your honey how much you care than by whipping up a homemade chocolate dessert. It’s a guaranteed home run in our books! And we’ve got the best chocolate desserts to make the day great. 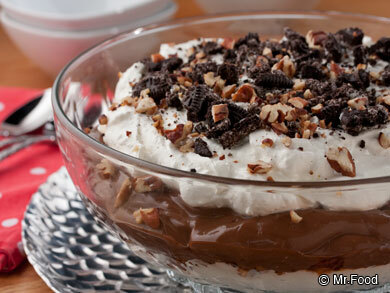 I mean, just look at our Chocolate Cookie Pudding below. Don’t you wish you could just reach through your screen and get a taste? You’ll find this recipe and more in Death by Chocolate: Dessert Heaven with 30 of Our Best Chocolate Recipes. Who stole the cookies from the cookie jar? If your cookie stash is emptying out sooner than you’d like, then we think it’s about time you had a cookie baking extravaganza with one of our latest eCookbooks, Cookie Jar Favorites: 35 of Our Best Cookie Recipes. And trust us, this cookie collection has it all, from easy-to-decorate sugar cookie recipes to classic chocolate chip cookie recipes with a few cake mix cookie recipes thrown in for kicks and giggles. With a selection like this, you may need to cancel your order from the Girl Scouts this year! 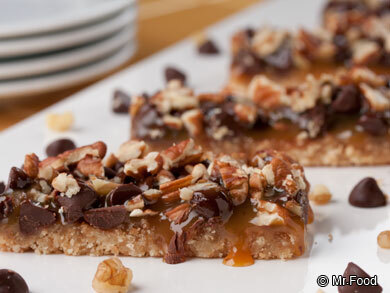 Take a look at our Gooey Turtle Bars below. For us, if something like that’s not homemade, then it’s simply not worth eating (and believe us, this is one cookie recipes that you’re going to want to eat). We hope you’ll want to check out our free eCookbooks, Death by Chocolate and Cookie Jar Favorites. Dessert time has never looked sweeter, especially with the best chocolate recipes and best cookie recipes you can find. Enjoy!